Do you leave customers smiling? 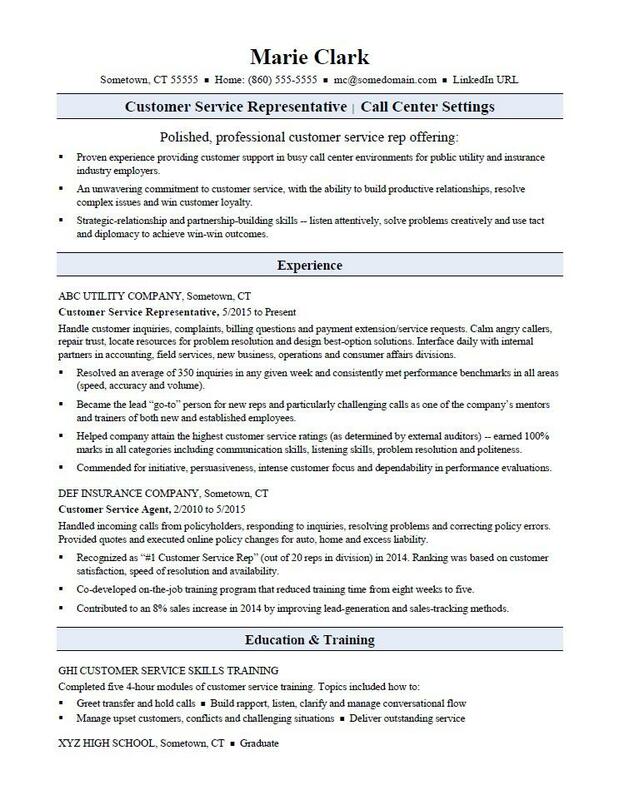 Then check out this sample resume for a customer service rep to see how to make your resume reflect your talents. Jobs for customer service reps are projected to grow by 5% (or 136,300 jobs) from 2016 through 2026, according to the Bureau of Labor Statistics (BLS). You’ll find the highest level of employment for this job in the following states: Texas, Florida, California, New York, and Pennsylvania; and in the following metropolitan areas: New York City, Atlanta, Chicago, Phoenix, and Dallas. As a customer service rep, you can expect to make a median wage of $32,890 per year, or $15.81 per hour, according to the BLS. In addition, you can learn about customer service careers and search for customer service jobs on Monster. Proven experience providing customer support in busy call center environments for public utility and insurance industry employers. An unwavering commitment to customer service, with the ability to build productive relationships, resolve complex issues and win customer loyalty. Strategic-relationship and partnership-building skills—listen attentively, solve problems creatively and use tact and diplomacy to achieve win-win outcomes. Handle customer inquiries, complaints, billing questions and payment extension/service requests. Calm angry callers, repair trust, locate resources for problem resolution and design best-option solutions. Interface daily with internal partners in accounting, field services, new business, operations and consumer affairs divisions. Resolved an average of 350 inquiries in any given week and consistently met performance benchmarks in all areas (speed, accuracy and volume). Became the lead “go-to” person for new reps and particularly challenging calls as one of the company’s mentors and trainers of both new and established employees. Helped company attain the highest customer service ratings (as determined by external auditors)—earned 100% marks in all categories including communication skills, listening skills, problem resolution and politeness. Commended for initiative, persuasiveness, intense customer focus and dependability in performance evaluations. Handled incoming calls from policyholders, responding to inquiries, resolving problems and correcting policy errors. Provided quotes and executed online policy changes for auto, home and excess liability. Recognized as “#1 Customer Service Rep” (out of 20 reps in division) in 2014. Ranking was based on customer satisfaction, speed of resolution and availability. Co-developed on-the-job training program that reduced training time from eight weeks to five. Contributed to an 8% sales increase in 2014 by improving lead-generation and sales-tracking methods. Once your customer service resume is ready to go, you want to make sure it's positioning you as the best person for the job. It should highlight your skills and experience, as well as the value you'd bring to a company. Could you use a little help? Get a free resume evaluation today from the experts at Monster's Resume Writing Service. You'll get detailed feedback in two business days, including a review of your resume's appearance and content, and a prediction of a recruiter's first impression. Think of Monster like your own personal customer service rep for your career.